After graduating from Morgan Township High School in 1979, Dr. Brian McGuckin attended Purdue University. He continued onto National University of Health Sciences in Lombard, Illinois and earned his Doctor of Chiropractic in 1985. Dr. McGuckin founded McGuckin Chiropractic and opened his first office in South Bend, Indiana in 1987. In 1995 he made the move to his hometown of Valparaiso, IN to use his knowledge in natural healing to promote solutions that work. At McGuckin Chiropractic, you’ll find both chiropractic care to address your spinal-related issues as well as nutritional services to help you solve your health challenges. We find that the adjustments hold better with the proper diet and nutrition that is specific to you. 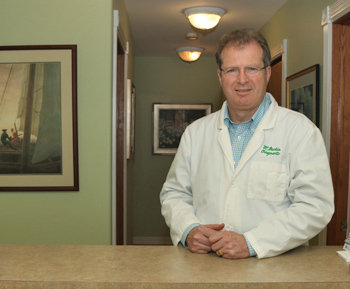 Dr. McGuckin’s personal experience led him to explore the world of nutrition and what it could do to assist those who hadn’t found solutions to their problems elsewhere. “There had to be a reason why I, and others like me, had issues that weren’t easily solved.” His experience and ongoing education have led him to incorporate a whole body approach to patient care. By looking at each individual holistically, we can discover underlying causes for health challenges, incorporating a treatment plan of diet, nutrition, exercise and spinal care we can achieve incredible results. We welcome you to find out what we can do for you. Contact us today to schedule an appointment for chiropractic or nutrition. We offer onsite laboratory and x ray services with early morning appointments to accommodate your schedule.